Wild & Precious: The Big Announcement! Well this time... the old wives' tale proved true! The other thing that proved true was my neighbor's dream. Remember these kids? They had since moved away but dropped by right after thanksgiving. After some hugs and small talk, one of the oldest girls (11yrs old) said to me, "the real reason we had to come by was because I've been having dreams about you. I've been dreaming that you are pregnant and that it is a baby girl!" Our chins dropped! We were only about 6 weeks (?) pregnant at that time and NO ONE knew! Pretty cool huh! We are so thrilled to be having a little girl. David's and my gut had been telling us this is what we would be having from the beginning. I woke up yesterday before the doctor and thought to myself, "there is just no way this isn't a girl. I know it is a girl." 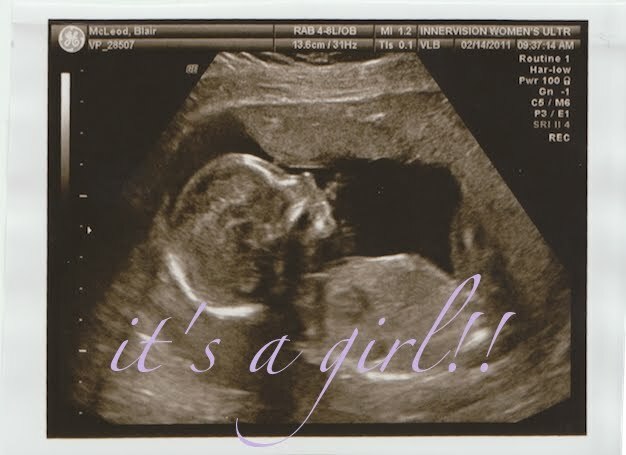 Sure enough... the tech told us she was 100% sure it is a beautiful, healthy, little girl! The name... She will go by Magnolia. Magnolia is a name that we just came up with. I'm not quite sure how, but I do know that we wrote it down a couple years ago as a leading contender. She might eventually go by Maggie, but we are going to try to make Magnolia stick. Catherine is a family name... my mom's name! But it is also my grandmother name and my first name. Although the spelling always alternates between C and K. So my grammie is a K, mom is a C, I'm a K, and now little one will be a C! I'm going to try to control myself from buying cute little girl things until the time comes closer... but it will be a challenge!! I'm adding a quick P.S. (several hours after first writing this post)... the more I think about it, I'm somewhat convinced that we got the name Magnolia from this beautiful song by Ellie Holcomb. It's a song about God calling out to one of his daughters, wanting her to dwell in his love and be his "sweet companion." Such a beautiful reminder of how God loves us and desires our hearts. 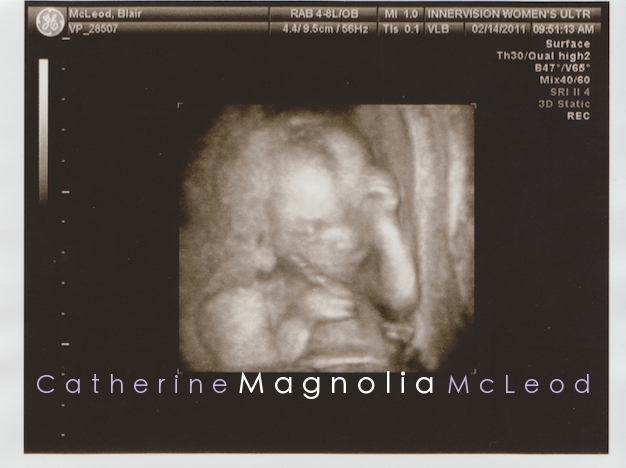 I am so excited to watch our Magnolia grow strong in the love of such a precious savior. Congrats! I love the name you picked...Magnolia is gorgeous! I wish I knew you in real life, I would totally buy you cute girly things! Congratulations! Love the name. Beautiful. What a pretty name! Congratulations! Awe! Congratulations! Little girls are just the sweetest! Beautiful name you chose - I especially love her middle name! that is such a beautiful name! Oh Congrats!! I love the name! i'll have to try the wives' tale test to see what we *might* be having! what a great blessing on valentine's day!! happy tuesday, friend! CONGRATULATIONS! I love the story about your old neighbour! congrats on finding out the gender! im sure it will be hard not to buy cute baby girl clothes, there's so much out there!!! love the name!! Congrats! That is such a beautiful name and I know (because of her genes) that she will be beautiful inside and outside. Congrats!!! So excited for you guys! This is really amazing and I love the little girl's name! oh yay! how exciting that you are having a little girl! can't wait to "meet" her!! i was so excited to get your text yesterday!!! woohoo! How exciting, baby girls are the best! what a wonderfully sweet name. I just love it. aw, so exciting!!! just thinking of all the sweet little girl clothes! Magnolia is a beautiful name! I'm so excited for you both! I know you can't wait to "meet" her! little girls are the best! Magnolia...oh my, what a treasure of a name! Wonderful news! you're going to love her to pieces. congrats! I, too, am excited for you both! Or, you three!!!!???!!!! Magnolia is so lovely. So southern. So sweet. Many blessings sweet friend. Yay! How exciting!!! Huge congratulations to you, I can't believe the old wives tale worked! Let the clothes shopping begin!! Congratulations! When my mom was pregnant with my 5 sisters and I...she always used that same method! Magnolia is a lovely name and I love how you can shorten it to Maggie. Wishing you and your family the very best! yay! so exciting! congrats! magnolia is so unique and so sweet! YAY!!!!!!!! So happy for you!!!! Congrats and LOVE the name! I am so happy for you! Congratulations. What a sweet, sweet name. Fantastic! Having been the parent of a girl for just over a year, I can tell you it's been a fun and wonderful ride. Congrats! I couldn't be more happy for you. Congrats, your blog is so lovely! Congratulations! Magnolia is such a lovely name!